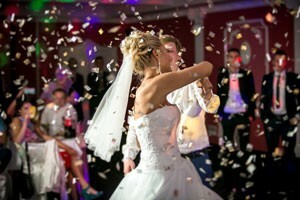 Are you looking for the perfect DJ on your wedding day? Tired of all the same songs played at every wedding that creates a “typical” wedding atmosphere? At Powerhouse Entertainment, we have been in the business long enough to read the crowd and to tailor the music to resonate with the environment. With a large music library that covers a wide array of genres, we’ve got you and your guests covered for every imaginable genre. We play all music including Country, Techno, Rap, R&B, Dubstep, Rock, Blues, Jazz, Oldies, Classics, and Top 40. Powerhouse Entertainment can also provide acoustic guitar for live entertainment that will add a unique flare to your wedding. Create a memorable experience for all involved or attending. We take pride in staying up-to-date on all music, so our music library is always growing. If we don’t have the song you are looking for, we can ensure you that we can find it. Powerhouse Entertainment uses the best equipment and lighting to create a first rate atmosphere. Put your magical day in the hands of a professional wedding DJ. With your direction, we can develop the ideal wedding entertainment. The DJ will be a fundamental part of your wedding reception, ensuring each segment of the day is announced and executed properly. Your Wedding Reception in Minneapolis will most likely be photographed and or videotaped and shared for a lifetime. Powerhouse Entertainment will help ensure your special day unfolds precisely how you have imagined. As you plan a DJ for your wedding day, why not consider a DJ for your engagement party as well. A live DJ is an amazing option for an anniversary party or even your bachelor or bachelorette party. Every legendary party begins with great music. We not only play the best music, we also make announcements to keep the party flowing in an orderly fashion. Powerhouse Entertainment will ensure your event is managed with professional announcements, high energy and music that will keep your guests grooving all night long. We also like to offer Requests-on-Demand, so each guest can interact with the music and hear some of their personal favorites. The memories of weddings, anniversaries, and engagement parties will last a lifetime, choose the best entertainer to set the stage for the rest of your lives together. Call Powerhouse Entertainment today for a free quote, we offer fantastic rates, free consultations and we are happy to answer any questions you may have. We serve the twin cities of St. Paul and Minneapolis and surrounding areas: Almelund, Almena, Amery, Baldwin, Balsam Lake, Center City, Centuria, Chisago City, Clayton, Clear Lake, Comstock, Cumberland, Cushing, Deer Park, Dresser, Forest Lake, Frederic, Grantsburg, Harris, Houlton, Hudson, Hugo, Lindstrom, Luck, Marine On Saint Croix, Milltown, New Richmond, North Branch, Osceola, Pine City, Roberts, Rock Creek, Rush City, Saint Croix Falls, Scandia, Shafer, Siren, Somerset, Stacy, Star Prairie, Taylors Falls, Turtle Lake, & Wyoming (Counties of Hennepin, Ramsey, St. Croix, Barron, Polk, Burnett, Chisago, Pine, Pierce & Washington).